Many of us spend a good portion of our time at work sitting. Students, as well, find themselves sitting through lectures and classes for most of the day. Of course, spending so much time in a desk chair, staring at a computer screen or text book, isn’t the best for our physical or even our mental health. We need to take breaks. In fact, numerous studies over the years have shown that physical activity during the work or school day improves productivity. If you or your child has attention-deficit hyperactivity disorder, physical activity is all the more important. You or your child may have a difficult time focusing when you aren’t moving. It’s been estimated that up to five per cent of British children have ADHD, a condition with symptoms that commonly includes difficulties with impulse control and maintaining attention, as well as noted hyperactivity and fidgeting. Interestingly, a growing body of research is showing that these active movements may play an important role in how the person with ADHD learns. Researchers are beginning to find that students with ADHD — and even students without ADHD — function best and learn more in an environment that allows them to move. Modern classrooms are beginning to incorporate fidgeting tools and other various opportunities for physical activity throughout the school day, and there has been a particular interest in pedal desks. This is where the DeskCycle can make a huge difference. How Can a DeskCycle Help with ADHD at School or at Work? The DeskCycle is like a small bicycle that fits under your desk, allowing you to pedal while you work or study. Because it uses magnetic resistance, it isn’t particularly loud, so it won’t disturb classmates or co-workers, and is designed to provide a smooth ride that won’t jostle your workload. For a student with ADHD, the DeskCycle can potentially help improve the executive function challenges caused by the condition, including helping with memory, planning, and concentration during the school day. For adults with ADHD, the DeskCycle provides these same benefits, making it easier to remember and focus on the task at hand. The DeskCycle has multiple resistance options, allowing the teacher, student, or adult to choose the appropriate resistance for the school or work day. Adults will likely end up enjoying the challenge of pedalling at tougher resistances, while kids could even make games out of their DeskCycles by timing themselves and pedalling faster or slower depending on the events of the classroom. Schools and workplaces are slowly beginning to change in ways that are beneficial to students and adults with learning differences. Gone are the days when a student with ADHD was told over and over again to “sit down and focus” with little positive result. These days, that same child might be offered a DeskCycle or a subtle fidgeting tool that allows them to use that hyperactivity — something they are actually doing to help themselves learn, it seems — to better focus and complete assignments without disturbing other classmates. Everyone is more productive and focused after physical activity, but adults and children with ADHD may particularly benefit from increased activity during the work or school day. While a DeskCycle is an extremely helpful choice, other ways to improve concentration include flexible seating arrangements in classrooms, standing desks, tactile tools like Play-Doh or clay, and even those trendy squish toys. If at all possible, adults and children alike will benefit from regular walks and exercise activities beyond the DeskCycle, as well as activities that involve meditation and mindfulness. How have you found physical activity to be beneficial for you or your child’s ADHD symptoms? What tools have you tried? 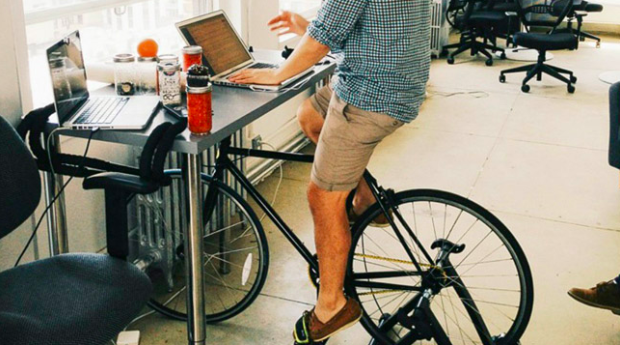 Have you tried a DeskCycle? Let me know your thoughts here or on Facebook, where I share my own thoughts for living a more mindful, active life.